Special Containment Procedures: SCP-1389 is to be kept in a protective Plexiglas case at all times when not undergoing testing. The surface of the image is extremely delicate, and must therefore be handled exclusively by personnel specially trained in the handling and restoration of antique documents and works of art. If, for any reason the need arises for SCP-1389 to be moved while it is not contained in its protective case, it is to be held only by the edge or the back of the icon. No further tissue samples may be taken from SCP-1389 without explicit permission from the site director. Description: SCP-1389 is a gilded icon of a Christian saint (presumably Mary Magdalene), rendered in the Russian Orthodox tradition. 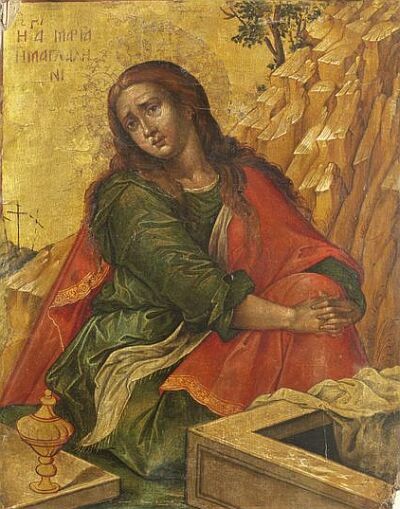 The subject of the depiction has an expression of great distress, and its image is raised approximately one millimeter from the background of the icon. The icon was retrieved from an Orthodox monastery near [REDACTED], Russia. SCP-1389's anomalous properties went unnoticed until increasingly large numbers of pilgrims were reported to be congregating there to see the "living saint". When asked about SCP-1389's origins, the resident monks claimed that the icon was given as a gift to the monastery by an anonymous artist, and that it had been in their possession for centuries. SCP-1389 has no abnormal visual attributes, but the figure it depicts is slightly warmer than standard facility temperature, at 35 degrees Celsius. X-ray imaging reveals a complete human skeleton directly underneath the surface of the image, flattened and to scale with the figure's form. No dissections have been carried out on SCP-1389 due to the possibility of destroying it, but CT scans indicate that fully functional circulatory and nervous systems exist underneath the "paint", implying that it is a living organism. Neurological tests have proven that SCP-1389 has an emotional reaction when spoken to, and is likely intelligent. Development is underway on potential methods for SCP-1389 to communicate. It was initially believed that SCP-1389 had no capacity for movement, but the figure has shown that it is capable of moving its eyes to follow an object. An interface based on those utilized by victims of full-body paralysis has been installed in front of SCP-1389, consisting of a panel of Cyrillic letters and common Russian phrases that are activated when it makes eye contact with them. After demonstrating the device's functionality to it, SCP-1389 has proven to be capable of communicating with testing personnel through this interface, but has thus far refused to respond directly to questioning. SCP-1389's statements can happen days apart from one another, and are often only semi-coherent. The following transcriptions have been translated from their original Russian.